The <blockquote> element specifies that the enclosed text is a long quotation. A URL for the source of the quotation may be given using the cite attribute. Although a text representation of the source can be given using the <cite> element. The blockquote element belongs to Flow content, sectioning root, palpable content category. The blockquote tag supports both Global Attribute and Event attribute. <blockquote> is used for an extended quotation. The <blockquote> tag specifies a part that is quoted from different source. To enhanced tutorials zone providing the best learning curve. Blockquote tag is start with <blockquote> and its end with </blockquote>. Here, the content we mentioned inside the blockquote is “To enhance tutorials zone providing the best learning curve” will be started with the free space before. 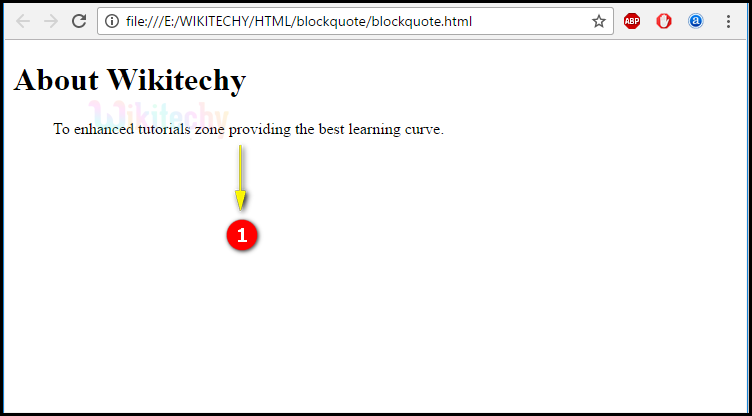 In this output browser window the content we mentioned inside the blockquote “To enhance tutorials zone providing the best learning curve” has been started with the free space before the sentence. cite URL Yes Yes Defines the source of the quotation. Blockquote is similar to Tab space or Intent, which makes the text/paragraph/sentence to be started with some free space before. <q> used for short quotations.